The reign of Catherine the Great saw English faience in all its diversity take the Russian market by storm. 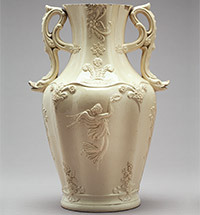 Its attractive price, compared to porcelain, and superior artistic design made English faience extremely popular with the Russian nobility: indeed, as the natural scientist and diarist Andrei Bolotov wrote, by 1796 many had started “buying, and filling their homes with English faience crockery”. It was accepted as perfect for everyday purposes, combining quality, practicality and elegance, and by the 1830s faience was commonly found in many households. Unlike porcelain, which was reserved for special occasions, “Faience dinnerware is not a luxury: it is used every day,” the writer Yevdokim Ziablovsky wrote in his work “Russian Statistics”.